――We would have thought of seeing you together like this, how cool! Did you ever think this would happen? ―― My exclusive producer Andy, he was like... (Yeah, Andy...) So see, I'm really here do. Had you all over met before? (No... ) What did you meat to start working on this project? Rick : First audition's music edition. ―― Now I have friends that have the bands and I've, you know, been to the garages, you know, band practice, things like that Rick, I know the history of music and you know, you know how band practice typically go, I want to know how band practice goes between you guys. Meryl : Well, we were... we were so lucky we had this... there's this old bar called "Rodeo Bar" down lower east side in New York, that was closing down after 40 years, and we rented it, and they loaded us in, and we began to how make ourselves into a band. Rick : make ourselves into a band, we have 2 weeks make it real. ―― You definitely made it really, Meryl, you're such a rocker, I mean you're totally. Do you... how you... how do she rate as a rocker? Rick : Incredible! I mean, really I... I was 7 in the scene and finished and we saw... there were rough spots in the work --? ?-- they're making of it, but what they want to on screen, and she totally killed it as far as I'm concerned. Meryl : it was really really fun, it's like a dream. In fact Joe Vitale, our drummer, told me that he and... and I think Rick Rosas also played in rock'n roll camp work... executive... thousands of dogs, go and... (yeah) be you, basically stand up in front and play lead guitar, but that it's like that was my dream, you know, I got do it, I get to live the fantasy. 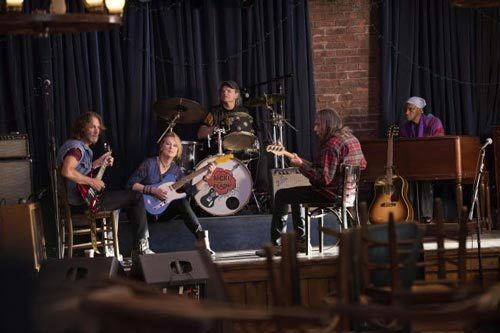 ――You have a line in the film, Ricki says "It's never too late for 2nd chances." and that really just resonated with me that you stuck out. Is that what we learn? Rick : Oh, yeah. Definitely it's... it's part, you know, one of... one of the things i think that run through the script. Meryl : Yeah, and I think it's... it's a function of Jonathan Demme, his film making style. He's very compassionate person and so that's gonna... that's going to come through it. Everybody's forgiving. Meryl : Everybody's hurt each other, and then they go... you know, oh God, you're never going to change. ―― never give up, never give up, never give up.